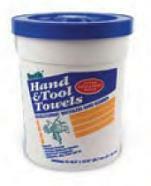 Hand & Tool Towels from Bostik use a non-toxic, organic cleaning formula saturated into a durable toweling material. These are used for cleaning or removing uncured urethane-type sealants, greases, tar or undried paints from hands, application tools or when spilled or smeared onto other surfaces including wood, glass and metals. Pleasant citrus scent.